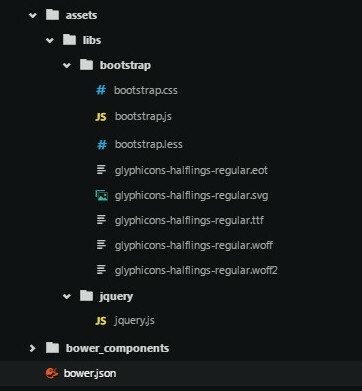 As a serious fan of Bower, I use it as often as possible for setting up projects yet, when pulling in files, I find that the bower_components directory is more fat than function: do you too? Recently, however, I discovered the difference between a standard Bower led project to that of one using bower-installer by Bret Little. With bower-installer you pull in only the files you need, as I shall illustrate below. 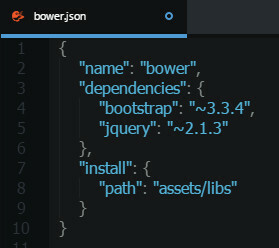 First things first, install bower-installer globally. Either way, you will need to cd into the project folder to continue. Far more workable, wouldn't you say? The only thing I have so far found that needs a slight tweak, is the location of the glyphicons in the boostrap.css file - needing to change url('../fonts/glyphicons-halflings-regular etc. to url('glyphicons-halflings-regular by the 'replace all' function of my text editor. Node: Simply hit the big green INSTALL button to download - the npm command-line tool comes bundled with the installation. Note: if you’re having trouble installing or working the above, try running $ npm update -g bower in your command prompt first.